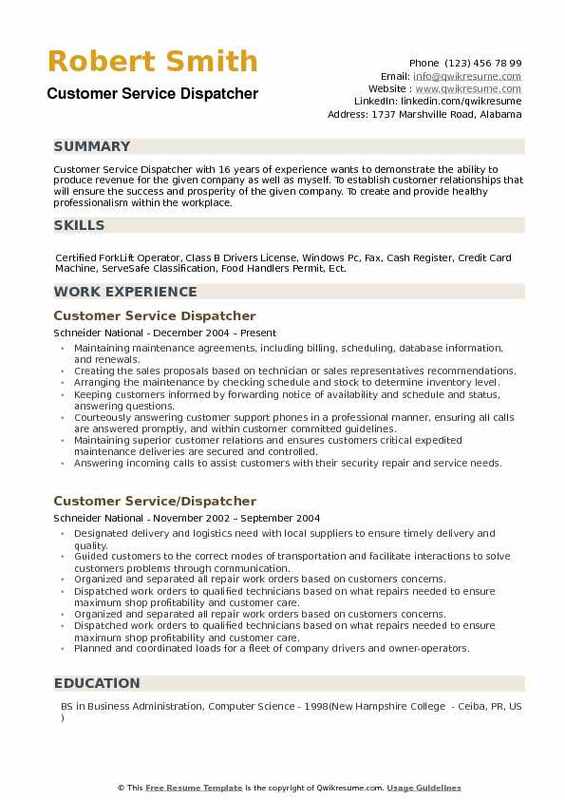 The Customer Service Dispatcher works for various industrial sectors and is responsible for attending calls and communicating the same to the related mobile units. 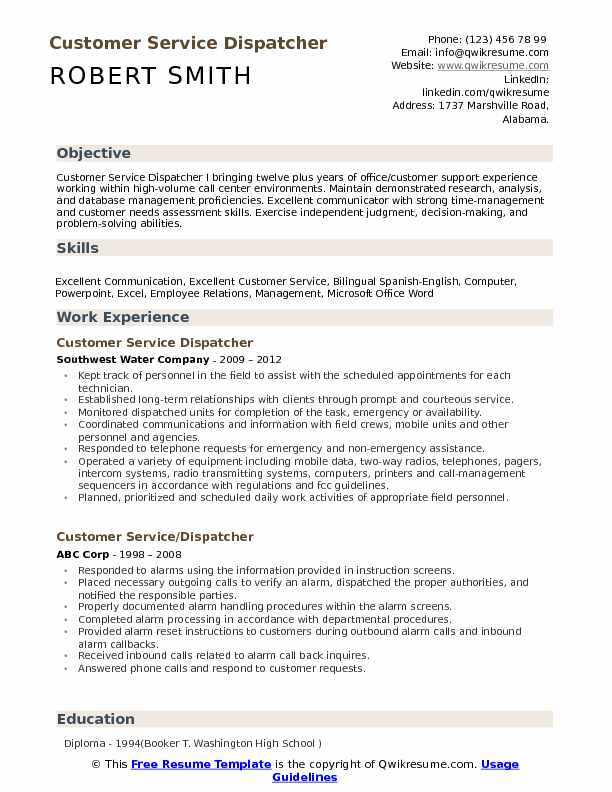 The main responsibilities of a Customer service dispatcher based on Customer Service Dispatcher resume sample include scheduling and routing calls to the concerned department, interacting with customers regarding sales, maintaining personal records of employees, customers and networking with vendors and clients. 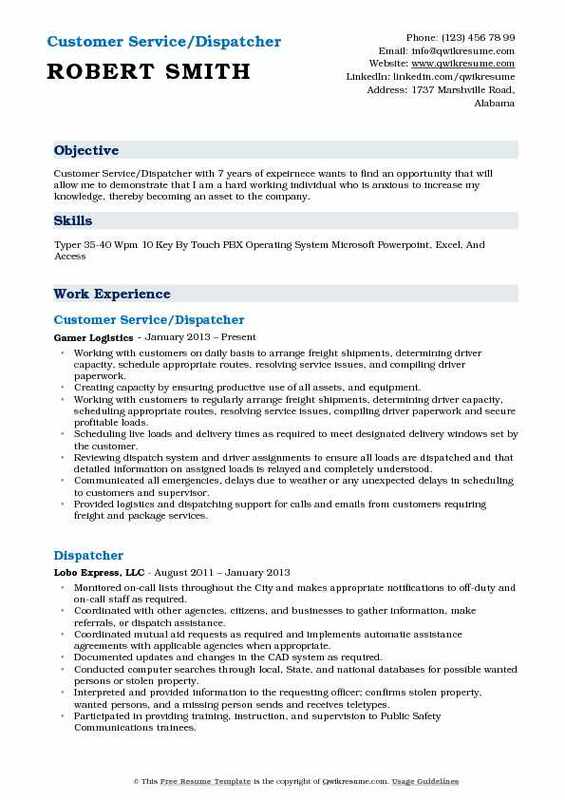 Summary : Customer Service Dispatcher I bringing twelve plus years of office/customer support experience working within high-volume call center environments. Maintain demonstrated research, analysis, and database management proficiencies. Excellent communicator with strong time-management and customer needs assessment skills. Exercise independent judgment, decision-making, and problem-solving abilities. Kept track of personnel in the field to assist with the scheduled appointments for each technician. Established long-term relationships with clients through prompt and courteous service. Monitored dispatched units for completion of the task, emergency or availability. Coordinated communications and information with field crews, mobile units and other personnel and agencies. Responded to telephone requests for emergency and non-emergency assistance. Operated a variety of equipment including mobile data, two-way radios, telephones, pagers, intercom systems, radio transmitting systems, computers, printers and call-management sequencers in accordance with regulations and fcc guidelines. Planned, prioritized and scheduled daily work activities of appropriate field personnel. Summary : Senior Customer Service/Dispatcher offering excellent communication and computer skills with nine years experience. Taking pride in working with a high level of accuracy, organization, and adaptability. Reconciled discrepancies between accounts receivable general ledger account and accounts receivable trial. Acted as a dispatcher to ten waste collection drivers in six states including monitoring daily trip records and travel logs. Acquired time sheets for all personnel assisting in payroll generation. Processed accounts receivable and accounts payable utilizing in-house accounting software. Reconciled and processed the expense reports for twenty-five internal and field personnel. Collected and processed all current and new-hire paperwork including confidential information. Responsible for company's entire fleet routine maintenance and certifications. Followed all company policies and procedures, ensuring the uniform and personal appearance are clean and professional. Maintained confidentiality of proprietary information. Summary : Customer Service/Dispatcher with 11 years of expeirnece wants to become a contributing member of an innovative, progressive Management team, employed at a stable leading edge company offering challenging and rewarding employment opportunities. 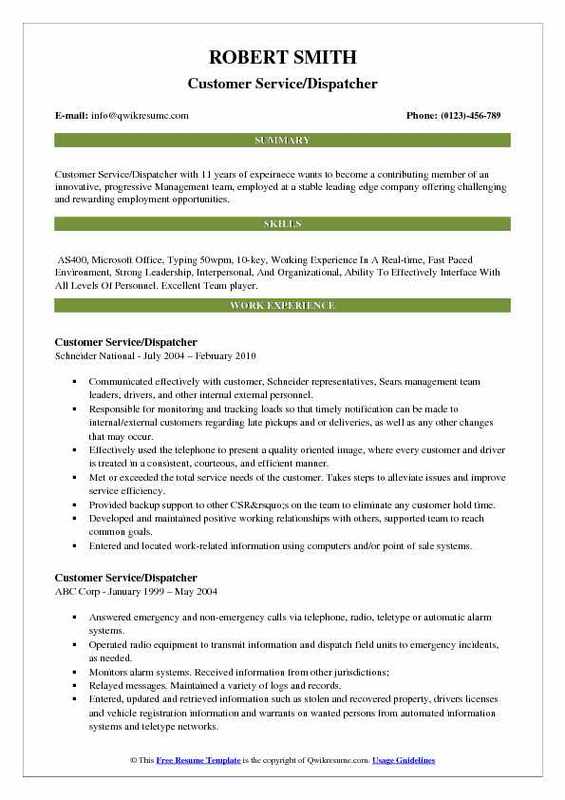 Skills : AS400, Microsoft Office, Typing 50wpm, 10-key, Working Experience In A Real-time, Fast Paced Environment, Strong Leadership, Interpersonal, And Organizational, Ability To Effectively Interface With All Levels Of Personnel. Excellent Team player. Communicated effectively with customer, Schneider representatives, Sears management team leaders, drivers, and other internal external personnel. Responsible for monitoring and tracking loads so that timely notification can be made to internal/external customers regarding late pickups and or deliveries, as well as any other changes that may occur. Effectively used the telephone to present a quality oriented image, where every customer and driver is treated in a consistent, courteous, and efficient manner. Met or exceeded the total service needs of the customer. Takes steps to alleviate issues and improve service efficiency. Provided backup support to other CSR’s on the team to eliminate any customer hold time. Developed and maintained positive working relationships with others, supported team to reach common goals. Entered and located work-related information using computers and/or point of sale systems. 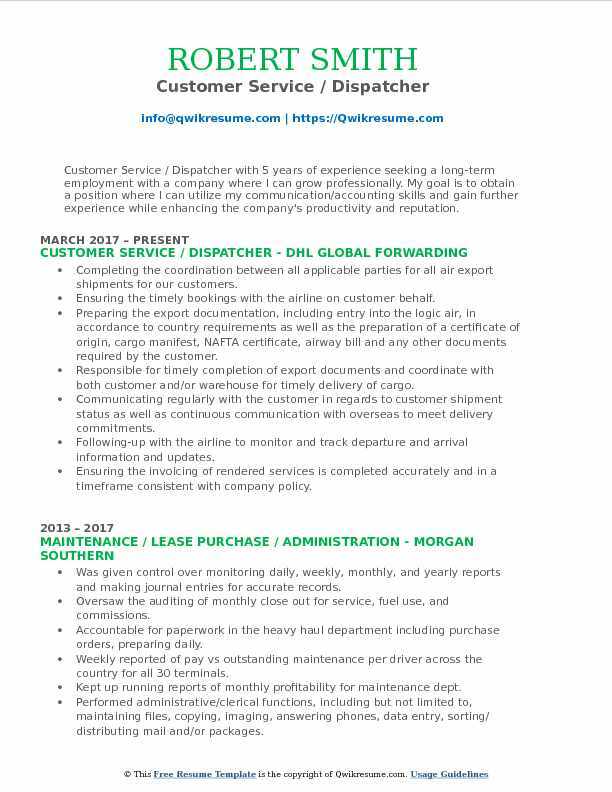 Summary : Customer Service Dispatcher with 13 years of collective customer service experience in the food, legal, manufacturing and freight industries. Seeking upper administrative or managerial position. Principal contact for all customer service inquiries, including but not limited to pallet spec questions, ordering, expediting orders, transportation, plant vendor scheduling and human resources. Managing seven CDL drivers in all transportation aspects to achieve at least 12 million in yearly pallet revenue, zero dot violations, and minimal truck/trailer maintenance costs. Overseeing two office employees ensure accuracy and entry of time-sensitive information in regards to all plant-specific A/P, A/R and payroll processes and serve as back up support for those processes. Collaborating with five plant supervisors to ensure on-time pallet deliveries, quality, and all-around successful plant functionality as a whole to ensure customer satisfaction and production quotas. Supporting/directing the dock employees and sorters with time management to maintain fluid incoming and outgoing material processing. Coordinating with sales reps to maintain successful customer account information. Provided assistance to customers and business partners concerning product deliveries, returns, and exchanges. Summary : Highly enthusiastic Sr. Customer Service Dispatcher with 11 years of experience results-driven Customer Services Representative with a proven ability to establish rapport with clients. Dedicated to maintaining customer satisfaction and contribute to company success and revenue. While working as a customer service representative in a demanding call center, I am an excellent communicator. Performing as the primary liaison between the customer and the field workforce in defining and meeting customer requirements. Assisting with the scheduling technicians for installation of thermostats and switches in order to meet customer demand. Responsible for soliciting enrollments for new incoming energy savings programs. Ensuring a "closed loop" communications process is in place with all customers. Obtaining monthly goals based on scorecards or performance feedback mechanisms which include all frontline phone responsibility metrics. Responsible for handling all troubleshooting issues pertaining to any installed devices and remotely logging on to the customers account to reset the devices. Contacting the appropriate personnel to ensure the safety and protection of persons and property. Prioritizing the incident reports and maintaining an accurate log to meet Federal, State, and University requirements. 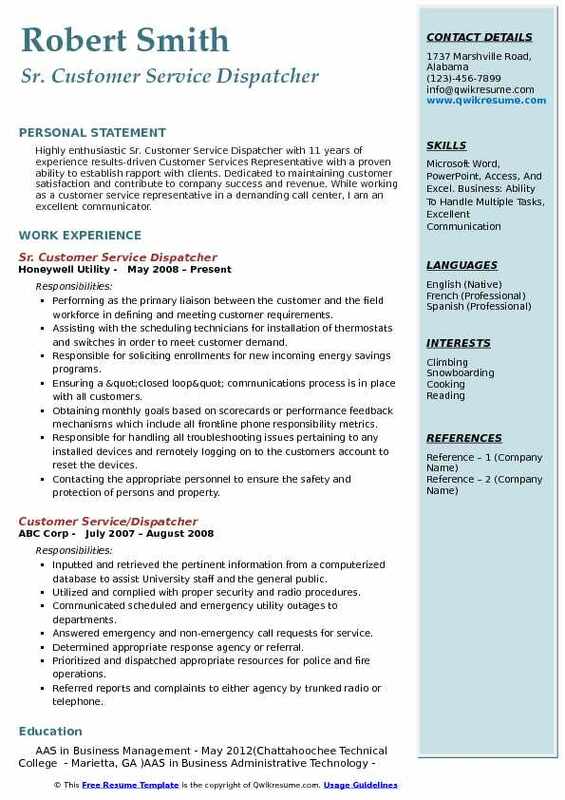 Summary : Customer Service/Dispatcher with 7 years of expeirnece wants to find an opportunity that will allow me to demonstrate that I am a hard working individual who is anxious to increase my knowledge, thereby becoming an asset to the company. Working with customers on daily basis to arrange freight shipments, determining driver capacity, schedule appropriate routes, resolving service issues, and compiling driver paperwork. Creating capacity by ensuring productive use of all assets, and equipment. Working with customers to regularly arrange freight shipments, determining driver capacity, scheduling appropriate routes, resolving service issues, compiling driver paperwork and secure profitable loads. Scheduling live loads and delivery times as required to meet designated delivery windows set by the customer. Reviewing dispatch system and driver assignments to ensure all loads are dispatched and that detailed information on assigned loads is relayed and completely understood. Communicated all emergencies, delays due to weather or any unexpected delays in scheduling to customers and supervisor. Provided logistics and dispatching support for calls and emails from customers requiring freight and package services. 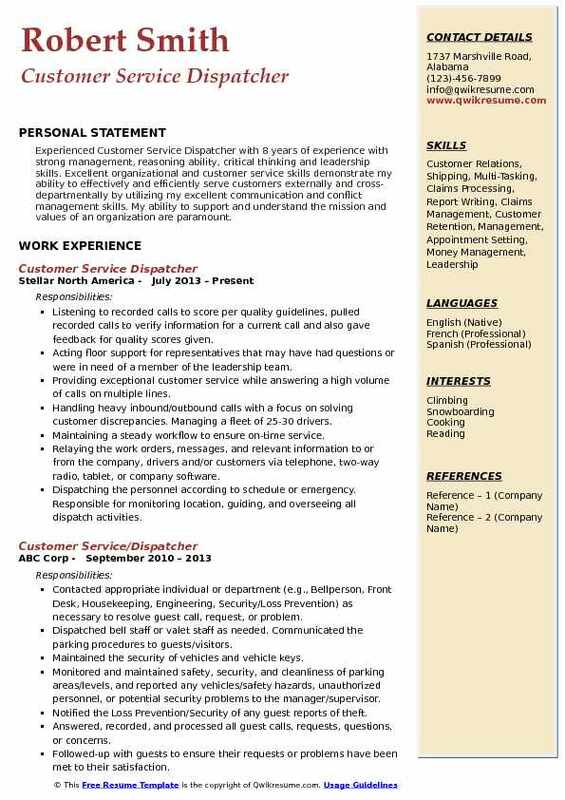 Headline : Customer Service / Dispatcher with 5 years of experience seeking a long-term employment with a company where I can grow professionally. 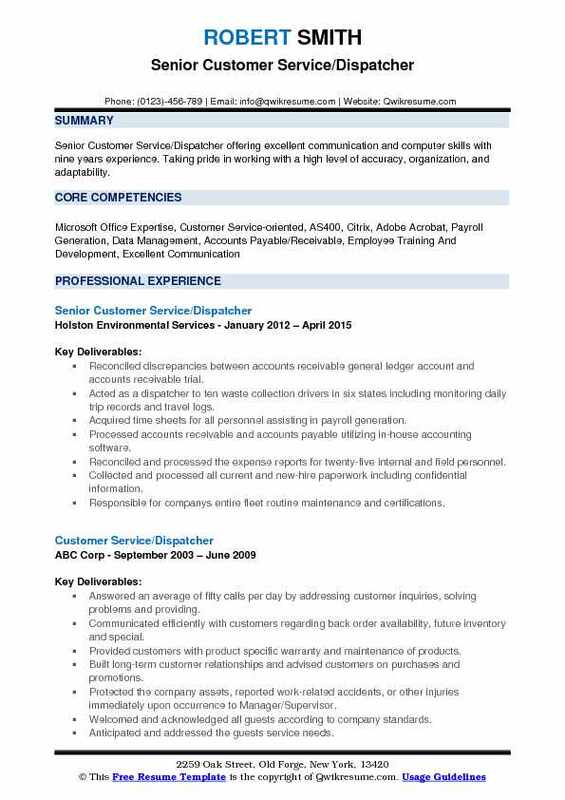 My goal is to obtain a position where I can utilize my communication/accounting skills and gain further experience while enhancing the company's productivity and reputation. Completing the coordination between all applicable parties for all air export shipments for our customers. Ensuring the timely bookings with the airline on customer behalf. Preparing the export documentation, including entry into the logic air, in accordance to country requirements as well as the preparation of a certificate of origin, cargo manifest, NAFTA certificate, airway bill and any other documents required by the customer. Responsible for timely completion of export documents and coordinate with both customer and/or warehouse for timely delivery of cargo. Communicating regularly with the customer in regards to customer shipment status as well as continuous communication with overseas to meet delivery commitments. Following-up with the airline to monitor and track departure and arrival information and updates. Ensuring the invoicing of rendered services is completed accurately and in a timeframe consistent with company policy. 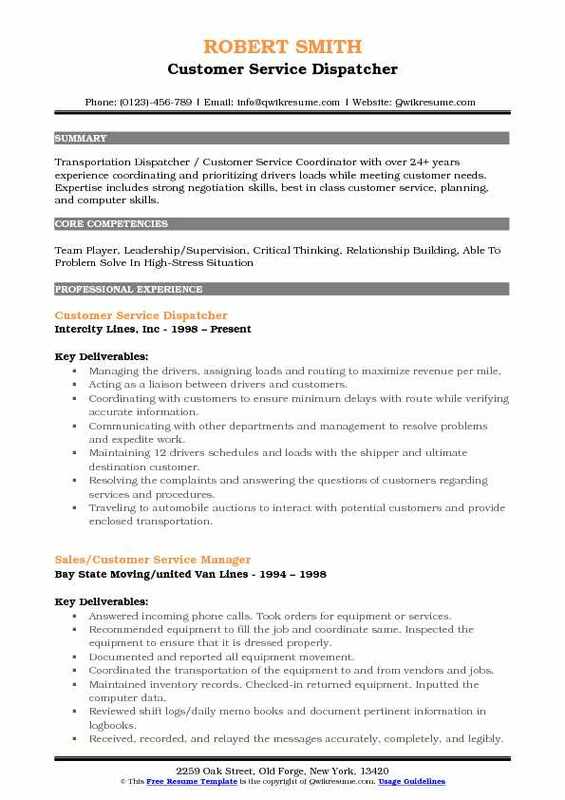 Summary : Transportation Dispatcher / Customer Service Coordinator with over 24+ years experience coordinating and prioritizing drivers loads while meeting customer needs. Expertise includes strong negotiation skills, best in class customer service, planning, and computer skills. Managing the drivers, assigning loads and routing to maximize revenue per mile. Acting as a liaison between drivers and customers. Coordinating with customers to ensure minimum delays with route while verifying accurate information. Communicating with other departments and management to resolve problems and expedite work. Maintaining 12 drivers schedules and loads with the shipper and ultimate destination customer. Resolving the complaints and answering the questions of customers regarding services and procedures. Traveling to automobile auctions to interact with potential customers and provide enclosed transportation. Maintaining the customer database (demographics, equipment and warranty information, birthday tickler file, etc. ). Prioritizing the service calls and dispatching the technicians based on territory and level of expertise. Summary : Experienced Customer Service Dispatcher with 8 years of experience with strong management, reasoning ability, critical thinking and leadership skills. Excellent organizational and customer service skills demonstrate my ability to effectively and efficiently serve customers externally and cross-departmentally by utilizing my excellent communication and conflict management skills. My ability to support and understand the mission and values of an organization are paramount. Listening to recorded calls to score per quality guidelines, pulled recorded calls to verify information for a current call and also gave feedback for quality scores given. Acting floor support for representatives that may have had questions or were in need of a member of the leadership team. Providing exceptional customer service while answering a high volume of calls on multiple lines. Handling heavy inbound/outbound calls with a focus on solving customer discrepancies. Managing a fleet of 25-30 drivers. Maintaining a steady workflow to ensure on-time service. Relaying the work orders, messages, and relevant information to or from the company, drivers and/or customers via telephone, two-way radio, tablet, or company software. Dispatching the personnel according to schedule or emergency. Responsible for monitoring location, guiding, and overseeing all dispatch activities. 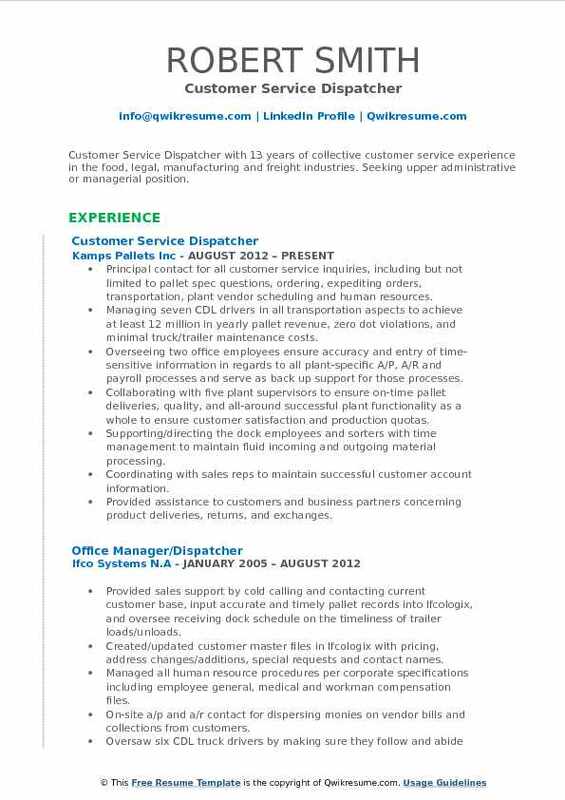 Summary : Customer Service Dispatcher with 16 years of experience wants to demonstrate the ability to produce revenue for the given company as well as myself. To establish customer relationships that will ensure the success and prosperity of the given company. To create and provide healthy professionalism within the workplace. Skills : Certified ForkLift Operator, Class B Drivers License, Windows Pc, Fax, Cash Register, Credit Card Machine, ServeSafe Classification, Food Handlers Permit, Ect. Maintaining maintenance agreements, including billing, scheduling, database information, and renewals. Creating the sales proposals based on technician or sales representatives recommendations. Arranging the maintenance by checking schedule and stock to determine inventory level. Keeping customers informed by forwarding notice of availability and schedule and status, answering questions. Courteously answering customer support phones in a professional manner, ensuring all calls are answered promptly, and within customer committed guidelines. Maintaining superior customer relations and ensures customers critical expedited maintenance deliveries are secured and controlled. Answering incoming calls to assist customers with their security repair and service needs. Scheduling technicians for service repairs. Maintaining and manage service tickets. Tracking technicians locations to ensure dispatches are done in a timely manner.